Should You Buy Into the Hype for These Stocks? Can Tesla, Autodesk, and Northern Dynasty Minerals live up to their potential? It's no secret that Wall Street is forward-looking. The big question we have to ask ourselves as investors from time to time is when is the market too forward-looking. In other words, when do the valuations of stocks far exceed their hype? With this in mind, we asked three of our Foolish contributors to weigh in on three highly hyped stocks to decipher whether they have what it takes to meet that hype. Find out what they had to say about Tesla (NASDAQ:TSLA), Autodesk (NASDAQ:ADSK), and Northern Dynasty Minerals (NYSEMKT:NAK). Rich Smith (Tesla): Has there ever been a more hyped stock than Tesla? Elon Musk's electric car start-up (hey, did you hear they make solar roofs, too?) makes battery buggies that can zoom from 0 to 60 in two seconds. More relevant to investors, Tesla stock has zoomed from$15 million in revenues in 2008, when it first introduced the Roadster, to $7 billion last year. That's more than 47,000% growth in just eight years. Tesla Model 3 unveil. Image source: Tesla. And yet, during all this time, Tesla has failed to earn a full-year profit even once. To the contrary, annual losses have ballooned from $83 million lost in 2008 to $675 million in 2016 -- an eight-fold increase. Sure, according to some analysts, Tesla might soon turn profitable -- perhaps not in 2018, but by 2019 for sure, says Piper Jaffray. But even then, and even if Piper is right, I have to wonder: Maybe Tesla will earn a profit in 2019. But what kind of profit will it earn? Will it earn the 3% operating profit margin that Ford Motor pulls down, for example? Or perhaps even the 6% margin that's more common at General Motors? Because based on those kinds of profit margins, investors value Ford stock at only 10 times earnings, and GM at a lowly 6 times earnings. Right now, with no profits to value Tesla on, investors happily pay several times annual sales for shares of Tesla stock. Once the company has profits to hang a valuation on, though, might they not decide to value Tesla stock on those profits? Because if that happens, then the $0.20 per share Tesla might earn in 2019 would only be worth about $2 a share at Ford's valuation, or a buck-twenty at GM's. Those are two far cries from the $308 a share Tesla stock currently fetches -- and one very big reason why I don't buy the hype surrounding Tesla stock. Demitri Kalogeropoulos (Autodesk): Surging optimism around Autodesk's business has pushed the stock up nearly 50% in the past year. What's most surprising about that rally is that it happened while the computer-aided drawing specialist endured a sharp decline in earnings. Net loss ballooned to $582 million in fiscal 2017 compared to a loss of $330 million the year before. In contrast, the company had been generating consistent annual profits of over $200 million as recently as 2014. Yet investors are salivating at the financial prospects that Autodesk's shift to a subscription-based selling model might soon deliver. After selling perpetual licenses for years, the company has transitioned to term based memberships through the cloud. 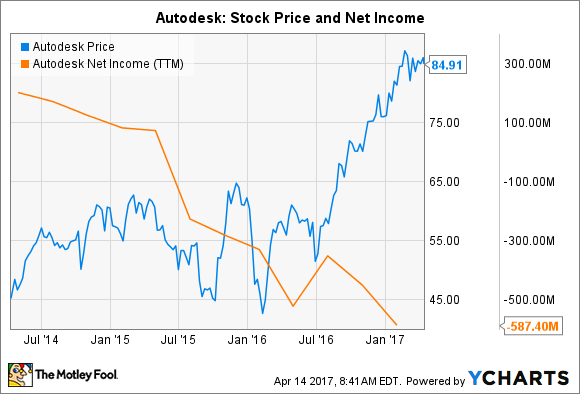 The shift is making Autodesk appear less profitable, since it now books revenue and earnings over time rather than in a lump sum. That makes subscription figures the key metric for investors to watch right now -- and the good news is that they have shown robust growth. Subscriptions jumped 21% last year to over 3 million, which represents a strong base of recurring revenue. Management believes it can boost subscriptions at a 20% pace in fiscal 2018, Autodesk's first full year under the new business model. If it can keep that momentum going, while also upgrading many of the company's maintenance customers into bigger, product-based subscriptions, Autodesk should make solid progress toward returning to profitability this year and earning its premium valuation. Sean Williams (Northern Dynasty Minerals): Northern Dynasty Minerals has, for lack of a better pun, been a hot commodity among short-term traders in recent months. The company, which is an exploratory-stage precious-metals miner, has the rights to the Pebble Project in Alaska. This project could, in theory, be mined out for well over 100 years. The election of Donald Trump, who is expected to relax a number of environmental protections (and thus ease the permitting of Pebble in Alaska), as well as rising physical gold prices on a per-ounce basis, have investors excited about the company's prospects. As for me, I'm not buying into this hype. The Group is in the process of exploring and developing the Pebble Project and has not yet determined whether the Pebble Project contains mineral reserves that are economically recoverable. In other words, there are no guarantees that, even if the minerals that are in the ground are proved resources, the company has a way to recover those minerals for a profit. Even if the company did, it's going to need a heck of a lot more capital than it has now. It ended the fourth quarter with $7.2 million in cash and cash equivalents, but burned through $24 million in 2016. It did complete a secondary share offering in January for $32 million, but with the way it burns through its cash on hand, this only buys it about a year. Plus, developing the Pebble Project would cost billions upon billions of dollars, and we'd likely be two years, if not more, out from commercial production commencing. What bank in its right mind is going to lend that much to Northern Dynasty without any assurances that recovery can be done profitably for an extended period of time? Pebble has changed hands a few times prior to Northern Dynasty scooping it up, and there may be a good reason its prior owners ditched the asset. Put plainly, investors putting their hopes into Northern Dynasty could be sorely disappointed.